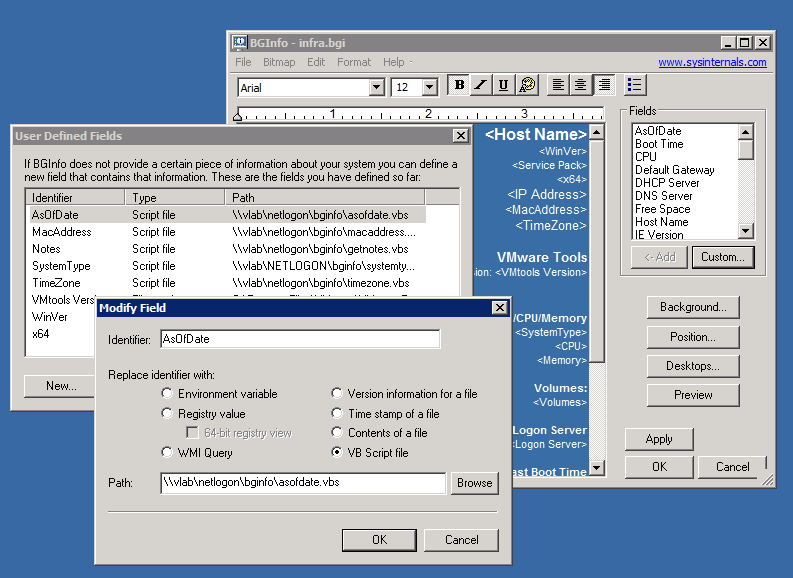 I saw Ivo Beerens’ blog post about using BGInfo and VMware View: Display the protocol used on the VMware View desktop background and it made me think of some of the scripts I’ve used. I figured I would share them. I’ve used BGInfo for years, and have collected several scripts that I have used for various pieces of info that isn’t always the easiest to get from either the Windows registry or other places. When I worked for a Service Provider, it wasn’t uncommon to have systems spread across different Windows versions, multiple time zones, 64 or 32 bit, etc. Here are some of the scripts I regularly used when I was an Administrator. If Len(strSystemType) = 0 Then strSystemType = "Not Found in WMI"
If Len(strWinVer) = 0 Then strWinVer = "Not Found in WMI"
And some new ones I created after seeing Ivo’s blog post. I hope they are useful to others as they have been useful to me. Update: In the comments section, Alexandru asked for how I was pulling the VMware Tools version. I’m simply pulling a file version from the vmtoolsd.exe executable. Nice post, and couple scripts are very useful. BTW, where did you get the script with VMware Tools? I would like to have one. I just did a file version check on the VMtools executable. 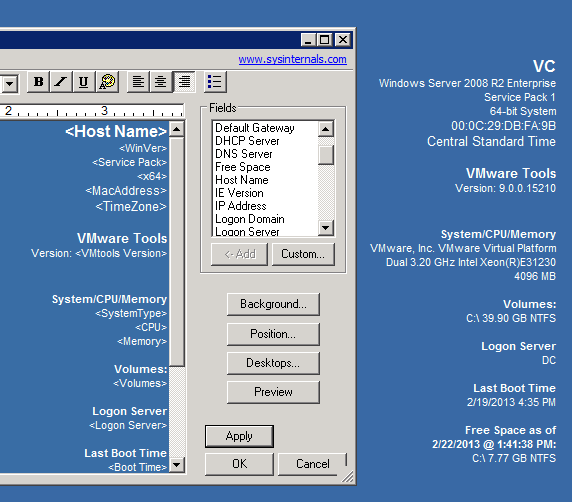 I’ve updated the post with how I’m getting the VMware Tools information. Great post and very helpful! I’ve discovered a problem, however. I am running with VMware AutoDeploy Stateless ESXi hosts. It appears that one cannot add the isilon_nas_vaai_plugin to a Image Profile and have it successfully install as one can with the EMC VNX NAS Plugin. I run 52 hosts that are all ready to get into the fun with Isilon–but none of them can load the Isilon plugin since they boot stateless. Is there any chance the Isilon team will fix the plugin to behave more like the EMCNASPlugin we use for VNX arrays? If not, my Isilon cluster will have to be sent back. I ran across this issue as well. I have asked if AutoDeploy will be an option at some point. I haven’t heard anything back, but will let you know if I hear anything. I’d submit a support ticket, just to get some documentation in place. I know of a small workaround when it comes to auth_gen, but it still doesn’t get the plugin installed. If I run across a complete workaround, I’ll let you know. All I can find to display is “1/1/2013”. 'Item (1) is everything to the right of "y, "
I have a workstation set to UTC time, but I want to add another entry to show local time too…how can I do this? I would create a new variable, grab the UTC time, and then display it. I’m trying to copy your “GetNotes” code to grab text from my host file, but keep on getting an error on the Echo strNOTES portion. It gives me a Type mismatch: ‘Echo’, Code 800A000D. I’m not that familiar with VBS, so any tips? Unfortunately I don’t have a Windows environment setup right to test it. I’ll have to get back to you. I read on another site that when using VB in BGInfo you need to use just Echo instead of Wscript.Echo. Even though it will error out in an app like PrimalScript, it will work in BGInfo. Could you please provide me script to get Host – IP Address? I’m assuming that you are asking for the IP of the vSphere host the VM’s are residing on. I think that might be a little more complicated. I wonder if anyone over at VMTN.net has a script for that. I have a two network, both having different default gateway. By gateway we have to display name in desktop. please help on this, is this possible?! You would have to have a custom script query the NICs, pulling that information, and passing it to BGinfo. I don’t have a Windows desktop (or any desktop that has multiple VLAN assignments) to test this, sorry. É possível inserir calendário no BGInfo ? como fazer? You would have to have a custom script execute and then return that information to BGinfo. Any views or opinions expressed here are strictly my own. While I am a blogger who works for VMware, I am solely responsible for all content published here. This is a personal blog, not a VMware blog. Content published here is not read, reviewed, or approved in advance by VMware and does not necessarily represent or reflect the views or opinions of VMware or any of its divisions, subsidiaries, or business partners. Any of my code, configuration references, or suggestions, should be researched and verified in a lab environment before attempting in a production environment. Agreement to use any of my code or recommendations, removes me from any liability as such. Secure by Default – Why did it take something like GDPR to do this? How long does it take to… Enable vSAN Encryption?